When I was pregnant with Willow I was given a Bounty pack by my midwife at my 8-week booking appointment to keep my maternity notes in, that broke within weeks of having it and was more a walking advertisement for Bounty that anything for me. This time around, I wanted to use something that would keep my maternity notes safe, would have some beneficial information for me and would also benefit other expectant mamas too. That's why as soon as I found out I was pregnant, I ordered a MAMA Academy Wellbeing Wallet. It's large enough to hold my maternity notes and any and all leaflets, letters and random slips of paper that I am given for this pregnancy. Having one place to keep everything together is invaluable, I'd be forever trying to find everything otherwise! It's also really well made; when I head to my hospital for consultant appointments it's rammed full of my maternity notes, every document I've collected so far and often also pens, my pregnancy diary (where I write any questions I have) and little pots for urine samples. It ends up being quite full and a little heavy yet after 33 weeks it's still perfectly intact and like new! 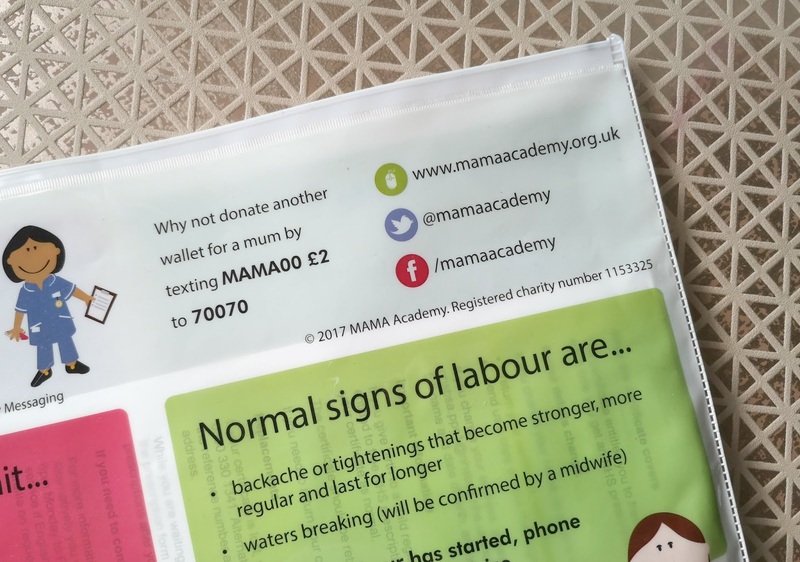 What makes the MAMA Academy Wellbeing Wallet stand out compared to the usual 'freebie' wallet you get at your booking in appointment, almost always a Bounty branded one, is the information on the wallet itself. It has key points on both sides of the wallet, with things you should look out for such as reduced movements and other important things to look out for which should prompt a call to your maternity unit. There's a rundown of the normal signs of labour, ways to look after yourself, foods you should avoid and things to make sure you discuss with your midwife. This might all seem basic information but a lot of the things included are things I know many expectant mothers like myself have frantically Googled as we were unsure. It's essential and important information to have on hand. The wallets themselves only cost £2 each, including delivery, which I am sure you will agree is a super budget-friendly price for any expectant mama. There is also an option to donate or 'fund' a Wellbeing Wallet to another expectant mama when ordering your own, which I opted to do when ordering mine. 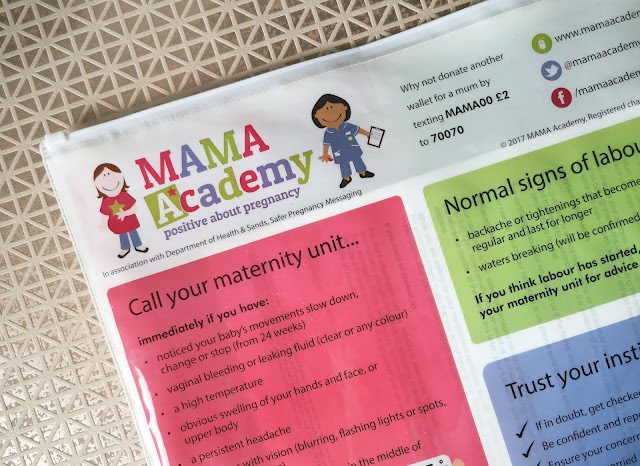 If you're expecting your own little one, I really recommend ordering yourself a MAMA Academy Wellbeing Wallet, available online at www.mamaacademy.org.uk. The website also has tons of helpful information for expectant mamas, midwives and healthcare professionals and lots of free resources, so definitely worth a good browse!